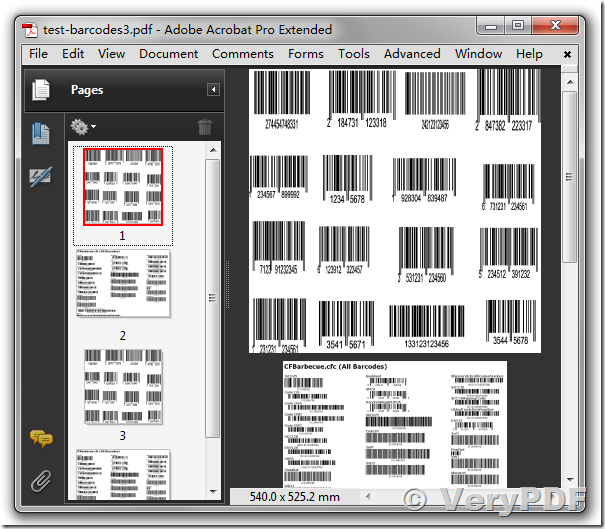 ← How to Read Barcode from PDF Documents? The PDF documents are usually comprised of Text, Image, Table, Attachments, Graph, Annotation and other related objects. There are cases when Barcodes are embedded inside PDF file and some customers have the requirement to identify the Barcodes present inside the PDF file. The following article explains the steps on how to extract images from PDF pages and identify the Barcodes inside them. According to Document Object Model of "VeryPDF Barcode Recognition SDK" for .NET, a PDF file contains one or more pages where each page contains collection of Images, Forms and Fonts in Resources object. So in order to extract images from PDF file, we will traverse through individual pages of PDF file, get the collection of Images from particular page and save them in MemoryStream object for further processing with BarCodeReader. Dim strOutFile = strFolder & "\_type2_code39.pdf"
& """ """ & strOutFile & """"
strOutFile = strFolder & "\_type2_code39.png"
Dim strBarcodeFile = strFolder & "\barcode.pdf"
strCmd = "-$ XXXXXXXXXXXXXXXXXX -decode """ & strBarcodeFile & """"
This entry was posted in Barcode Generator, VeryPDF SDK & COM and tagged barcode api, barcode ocr, barcode pdf, barcode recognition, barcode sdk, barcode text. Bookmark the permalink.